Take a trip around the world with Bilbo to see if he can win the heart of his true love! 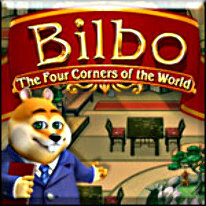 In Bilbo: The Four Corners of the World, YOU choose the menu based on the tastes of your guests and then do everything in your power to earn Bilbo a big tip! From seating guests, to taking orders, to serving meals, there's plenty to do! Featuring a cast of wonderfully animated animal characters, Bilbo The Four Corners of the World will have you grinning from ear to ear!